Red is the foundation male for the Barrel Select bloodlines. In every aspect, he is the paramount example of diversity being handsome, biddable, and talented. Not only was he owner handled to his championship with limited showing, but Red is actively training and competing in hunt tests, obedience trials, and canine scent work (www.nacsw.net). We have always felt that given the opportunity, there is very little that Big Red could not accomplish. 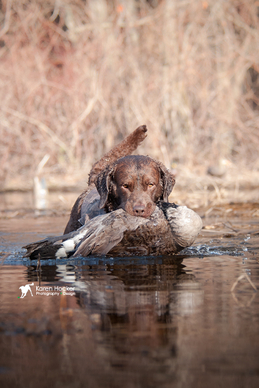 During the hunting season, Red is Todd's best hunting companion in over twenty years; he will happily dig out even the most difficult of retrieves. His short, thick coat have allowed him to never know a cold day even in some of New England's nastiest coastal weather. He will work happily from a canoe, boat, blind, or natural cover and has the stamina to work a full day flushing and retrieving pheasant. Red also has one of the softest mouths we have ever come across... he serves as quail wrangler at home retrieving completely alive and unharmed any potential escapees from the pen. Red's personality and temperament are what make him so unique. His extremely stable demeanor has allowed him to be the neutral dog for the rehabilitation of dogs with dog aggression issues, as well as helping to build the social confidence of fearful or under socialized dogs and puppies. While being true to his Chesapeake routes by being appropriately territorial and loyal to his family, he is tolerant of all animals and people. His calm confidence, even in the face of a threat, makes him a pleasure to be around. Red currently has his JH (AKC) and HR (HRC) titles; he also has his NW1 title (Nose Work Level 1), CD (Companion Dog, Novice Obedience), and RN (Rally Novice) title. Red has mostly retired from hunt tests, although he is still hunting an extended season every year. He continues to compete in obedience, rally, and nosework. Watch Red below getting the first leg of his CD with a first place finish. Watch Now!